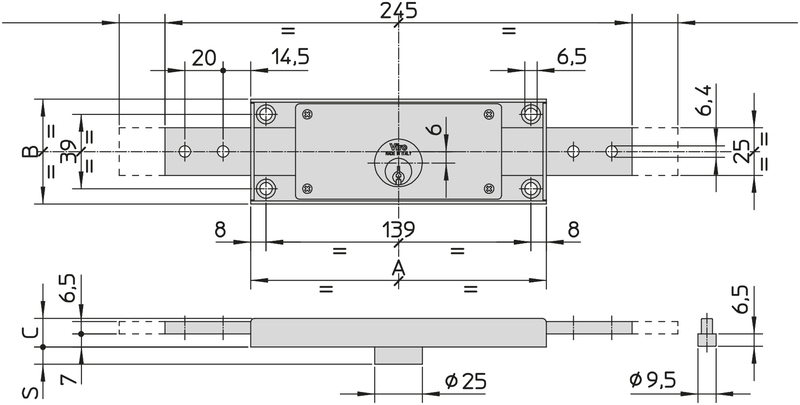 The 8230 series locks are interchangeable with the most common roller shutter locks already installed. The reinforced dead-bolt makes the roller shutters more resistant to attack, thus making these locks ideal for installation also on motorized roller shutters. 2 mm thick steel, folded back to give an overall thickness of 6.5 mm. Projection 24 mm. 6 mm projection for thinner and lighter roller shutters. supplied with 2 symmetric profile nickel-plated brass keys; operating from both the outside and the inside. single packs, in polyethylene bags, in 2 piece boxes. Bended dead-bolts with loose pins (.84);	For special versions, add the version code to the item code. E.g. 8231.9.84 = Central lock with 9 mm cylinder projection, bended dead-bolts and loose pins.